Mike Wang (pictured), hired away from 2K Sports by EA Sports to help turn around the sagging NBA Live franchise, is back with the NBA 2K team after just one year working on Live. Wang, the lead gameplay designer for Live, was a highly touted hire for EA Sports and was the promotional face of that game leading up to its release. His return to Visual Concepts is shocking news not only because of his short stay at EA Vancouver, but also because this rivalry had become rather chirpy late last year. "When I heard there was an opportunity that Mike might be interested in coming back, I sat in my office behind a closed door for a good long while thinking about what to do next," said Greg Thomas, the senior vice president of sports development at 2K. "He was a key member of our team, and now he was going and building a competitive product. I started talking to our team about it, not at all sure how they'd react." Thomas said Wang was welcomed back enthusiastically. "Every one of them were open, they took the angle of ‘Mike's a talented guy, we can always use talented guys, let's bring him back to the team,'" Thomas said. "It really is a double win for us." What provoked Wang to leave? "Talking about Live 11, and what [EA Sports] wants to do with the game, it was clear we wanted different things creatively," he said. "I left on pretty good terms. They were happy I stuck it out as long as I did." NBA Live, at best a mediocre game since the advent of the Xbox 360, narrowed the quality gap with NBA 2K in this year's edition. Sales figures did not follow however; NBA Live 10 actually sold less this year than NBA Live 09. NBA 2K10, meanwhile, recently eclipsed the 2 million mark in copies sold. "People at EA Sports are not happy with those sales figures," Thomas said. "They're looking to go in a different direction, probably strongly in a different direction." On its official blog, EA Sports posted a brief statement from NBA Live lead producer Sean O'Brien about Wang's departure. "I wanted to take this opportunity to personally thank Mike for his contributions during the 18 months that he was working on NBA Live," O'Brien wrote. "His vision and leadership within gameplay on NBA LIVE 10 was part of the reason why that game was critically reviewed as having taken a tremendous leap in quality and at least as good as any other basketball game on the market." That leap in quality clearly irked 2K. As it battled problems with NBA 2K10's online multiplayer and readied patches amidst community grumblings, EA Sports was actually getting praise for its first big update. That led to oblique insinuations, by 2K, that the Live team had been working on this patch prerelease knowing the retail code was inferior. EA Sports sniped back with screenshots and testimonials from gamers selling off their NBA 2K10 in favor of Live. Going forward, it's clear 2K Sports thinks it's stopped Live's comeback at one-and-done. Wang's stature within the basketball sim world made him a celebrity hire for EA Sports Vancouver, and he was frequently used in the media campaign spotlighting the game's development. Back at 2K, Wang is a member of a team - albeit an important one. Wang said there are no restrictions or agreements made on his return employment with 2K. "It wasn't a scouting mission," he said of his 18-month tenure at EA Sports. "The guys over here, they are already building great stuff, they're not looking to Live for things to put in 2K11." Rob Jones, a producer, said the return of his colleague has delivered a surge in confidence. "Every year we always shoot for the moon," he said. "Bringing Mike in really bolsters our focus and confidence. We know his talent." Thomas likewise sees the morale boost delivered by Wang's return. "There's more of a swagger, more of a confidence now that Mike is back on the team," he said. "[I see] more of the overall strength in the team, and I see it in them talking about all the great stuff they're doing in 2K11." 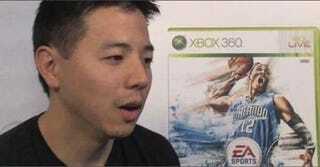 Mike Wang picture captured from Gamespot video.